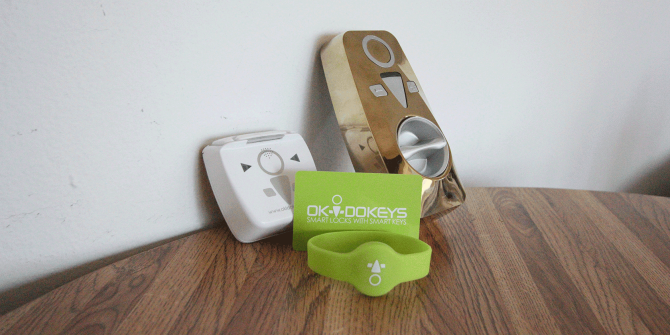 If you’re living in rented accommodation or just uncomfortable drilling holes in your door to fit a smart lock, Okidokeys might be the solution you’re looking for. It’s a retrofitting universal smart lock designed to work with standard deadbolts common across the US. Read on for the full review, then scroll down to the end for your chance to win one for yourself. The fact that it came even with tools necessary for installation was very convenient. I didn’t have to go hunting for screwdrivers or shuffling through old drawers for functional batteries. The package we tested comes in at $259, with chrome, satin brass, and antique brass cover. A marginally cheaper $249 version is available with black, white, and paint-it-yourself. An even more affordable option ($189) excludes the smart-reader, instead relying just on the Bluetooth link with your phone. In terms of competition, the Okidokeys goes squarely up against established brands like the $249 August Smart Lock, $219 Kwikset Kevo deadbolt, and $278 Goji Smart Lock. Physically installing the smart-lock was easy enough that even I was able to do it, and as someone who hasn’t touched a screwdriver in years, it’s impressively simple. You tape over the outside-facing side of the deadbolt to keep it in place, unscrew the part of the deadbolt that faces inside, and replace that with the Okidokeys smart-lock. The smart-lock has a metal plate with a rubber backing which screws into the hole where your manual locking mechanism used to be. It keeps it snug and secure against the wall without causing any permanent damage or requiring you to drill any holes. With the metal plate on the wall, the smart lock screws onto that securely; then you pop in the batteries, cover it with one of the three plastic covers, and you’re good to go. The smart-reader has an adhesive backing enabling it to be placed somewhere outside within 10 feet of the door. The concern I had with the reader is that I’m not so sure how long it would stick around in my neighborhood. Maybe you live in a nicer area than me, but any sort of fancy smart device on outside of my door is likely to either be stolen or at least broken within a week. Concerns aside, once the smart-lock and smart-reader are set up and ready to go, actually getting them to work is a whole other ball game. There’s a little internal rod that the smart-lock has to latch onto to be able turn the deadbolt. You’re supposed to align the knob so that it is vertical when unlocked and horizontal when locked. But when I set it up that way, it wouldn’t lock all the way. It would turn the deadbolt about half the distance, which technically locked the door, but the deadbolt could easily pushed back in or jiggled enough to get it to retract. So I changed the alignment so that it would be horizontal while locked and vertical while unlocked. It then (usually) turned the deadbolt the full distance, allowing it to lock in place. But this introduced a new problem: the smart-lock got confused and would automatically unlock itself whenever I tried to lock it from inside. Now, I don’t know about you, but having your lock beep loudly at you and unlock itself every time you try to lock it was a bit frustrating for me. I spent quite some time fiddling with the alignment of the lock with the internal rod, trying to find a position that would allow my door to lock and function properly. I never was able to find that balance. The closest I got, after scanning through the FAQ and support on Okidokey’s website, was to have the smart-lock only twist the deadbolt partially, but at least then it would allow me to lock it from inside without it unlocking itself — even if it wasn’t truly all the way locked. If this sounds like an imperfect solution, that’s because it is, and we’ll delve more into that in the Everyday Use section. Additionally, the smart-lock comes with a small magnetic sensor that allows it to detect when the door is shut, enabling more advanced features like auto-locking 30 seconds after the door shuts. In my case, the wall is over an inch away, so this simply wasn’t possible to install. The core features still function as described though, and the sensor is an optional extra. To be quite honest, this smart-lock doesn’t quite scream future in the same way that other smart locks do. The plastic covers that try to imitate common metal colors just look and feel quite cheap — though satin brass did match my door knob perfectly. The three big plastic grey buttons on the top also add to the toy-ish feel. In fact, several of my friends commented on it and asked if it was a real lock or just a toy. Not only that, but the buttons aren’t that useful. Normal Mode: lock and unlock the Smart-Lock with authorized Smart-Keys, middle button on the Smart-Lock, or manually with the thumb-turn or metal key. Passage Mode: the Smart-Lock will automatically stay unlocked for convenient free passage. Passage Mode with Tone: the Smart-Lock will automatically stay unlocked for convenient free passage. A tone will sound each time the door is opened (requires door sensor). Alarm: only “Favorite” users are enabled to unlock the Smart-Lock. Any other attempts to unlock will trigger the audio alarm. Alarm will also ring if your door is forced open (requires door sensor). Use an authorized Smart-Key to disable the alarm. Mechanical Only Mode: the lock can only be operated manually by the thumb-turn or the metal key. All electronic features are turned off. Good luck memorizing all those. My final gripe with the design of this device is that the knob for turning the deadbolt doesn’t lie flush against the smart-lock. That sounds like a small thing, but when buying a lock — the only thing that’s keeping people from just walking into your house — I think you want to know that time and care was put into crafting it. Such a lopsided knob is not the way to do that. Overall, this really isn’t a device that wows you straight out of the box. Once the device is set up and ready to go, how well did it work in the day-to-day usage? In all honesty, it didn’t really. Bluetooth connectivity issues severely limited its functionality. All five of the Android devices I have at home struggled to connect to the smart-lock. They would connect for a couple seconds, disconnect, reconnect, and repeat. The results were no better for iPhones when I set up the app on a couple of friends’ devices and authorized them to have access. When using the smart-reader, I found that the time it took to use it was a lot more than the time it would take to just put my key in the deadbolt and turn. In an effort to save battery life, the smart reader doesn’t stay on – so you have to hold down the power button at the top, then press your smart tag against it. This process takes a few seconds, and the reader then takes a few seconds to send the signal to the lock, by which time I could’ve just manually let myself in. Most of the time, the smart-lock made entering and exiting my house more of a hassle. But some of the time, it legitimately failed me. One day, I came back to find that it had unlocked itself. How long had the front door to my home been unlocked? I couldn’t tell you. But it’s pretty unsettling to find that. At least I know with a mechanical lock that it cannot unlock itself — but with the Okiedokeys smart-lock, I would never quite rest 100% sure that my door wasn’t unlocking itself. This feeling of insecurity may not be specific to the Okidokeys, but the cheap-feeling design certainly doesn’t help to alleviate concerns as we move into an era where everything is connected to the internet. Okidokeys has apps for Android and iPhone/iPad. The Android app really isn’t the prettiest software in the world, but that could be forgiven if it was functional. Unfortunately, because of the Bluetooth connectivity issues mentioned earlier, it really wasn’t even that. The idea of the app is that you can swipe to lock or unlock your door, and the smart-lock is synced through your phone’s interactions with it. You can assign other users and manage multiple locks from the app. If the Bluetooth issue ever gets solved, it’s a cool concept, but until then, it’s plagued with issues. After days of my lock not functioning properly after I initially set it up for hours, I uninstalled it, deleted my account, and started back from square one. Pouring over Okidokey’s technical support documents, I managed to get it as close to functioning properly as possible. It still has Bluetooth connectivity issues with most of my devices, the Smart Reader is still slow to use, but it seems to have stopped unlocking itself at least. My main issue with it stems from the fact that the small metal piece (Okidokeys calls it a D-shaped Key Cylinder Spindle Adapter) that connects my deadbolt to the Okidokeys isn’t exactly matched to my deadbolt’s spindle/internal locking mechanism. Inside, my deadbolt has a small 4-sided turning mechanism (the spindle) that is rounded on one side so that you can place a similarly-shaped mechanism (the adapter) over it, which can then turn it. The adapter that comes with the Okidokeys pack is slightly larger than the spindle, so the lock has some wiggle room before it actually begins to turn the deadbolt. This results in the deadbolt not fully moving into the locked position — no matter what. My door is still technically “locked” with the deadbolt only partially sticking out, but I certainly don’t feel as safe as when it is in the fully extended and locked into place. So, if one of the two included adapters fits your deadbolt perfectly, you shouldn’t have a problem. But if you’re unfortunate enough to have a deadbolt with a smaller spindle like mine, you’re going to have an awkward amount of wiggle room in your lock, and it may not push your deadbolt’s locking mechanism 100% into place. I ran into far too many issues with this device to be able to recommend it, but your experience may vary significantly. The experiences of Amazon reviewers seem to echo mine in a number of cases, while for others it worked carefully – such is expected with a system designed to fit something universally. Smart devices are a relatively new concept for most people, and there are some truly wacky ones out there Tweeting Fridges and Web Controlled Rice Cookers: 9 of the Stupidest Smart Home Appliances Tweeting Fridges and Web Controlled Rice Cookers: 9 of the Stupidest Smart Home Appliances There are a lot of smart home devices that are worthy of your time and money. but there are also kinds that should never see the light of day. Here are 9 of the worst. Read More , but smart locks are really something that you’re putting a lot of trust into — and this lock simply didn’t earn my trust. Please note, this prize is compatible with US deadbolts; as ever, the competition is open to all but may not work in your country.